3/4 ila 1.5 ons Kanada Kraliyet Darphanesi Gümüş Madeni Paralarına uygun Kahverengi Kapaklı Boş Monster Box These boxes are suitable for holding up to 20 tubes of RCM silver coins between 3/4 oz to 1.5 oz. These official boxes are direct from the mint and come complete with lids. 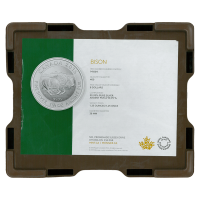 These boxes were used for a wide variety of RCM coins, sticker on the box may vary. Organize your stack and make it easy to store. Perfect for storing your investment!